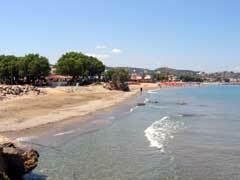 Agia Marina is a wondeful beach located at a distance of 6 Km from Chania town. At the middle of a long beach, which extends from Katos Stalos to Kolymbari, west of Chania. The golden youth of the city train daily to beach tennis or beach volley. Just opposite, Thodorou island, the only natural reserve of pure race Cretan wild goats. The huge cave which looks like a dragon mouth was a Minoan sanctuary and the whole island a Venetian fortress.